Why did I put off reading this for so long?! I think I didn’t want to be disappointed because I knew it was hyped up, but there’s a reason it was! THIS BOOK WAS SO GOOD. I’ve had this book on my radar since it came out and took the Booktube community by storm. I wanted to read it and have wanted to since it was released. Why did I wait so long? Because I’m a freaking idiot. This book follows Simon Spier who is a normal 17 year old boy who goes to high school. He’s involved in the theatre department at school and has a great group of friends. One thing no one knows is that he’s gay. No one except his secret email correspondent he found on the school Tumblr page who goes by the name Blue. Simon and Blue use pseudonyms so they don’t know who the other is, but they email back and forth and Simon finds himself falling in love with this boy. He wants to know who he is but doesn’t want to lose him, so he doesn’t push Blue into revealing who he is. This story was so cute and I don’t even understand how someone could not enjoy it. It was the perfect mixture of cute, heart-warming and smirking happiness with a very real-life feel. I loved that the only reason Simon didn’t want to come out was because he didn’t want it to be a big deal, not because he was scared. There aren’t enough young adult books about people with good, strong families who are supportive and loving all the time. The whole time I was making guesses and trying to figure out who Blue was, and I did guess it, but I wasn’t disappointed that I guessed it. I kind of knew right away when the character was mentioned, but still SO CUTE. Simon’s group of friends was amazing and had just the right amount of drama for a high school group. This made me miss high school and how simple it was, but how everything seemed like a huge deal. In the best way possible. *I mean I’m only a freshman in college but it’s very different from high school. * When you’re in high school EVERYTHING is a big step. From having your first kiss to starting to drink coffee. Everything seems like the biggest deal, and it’s adorably accurately portrayed in this book. I love that Simon isn’t scared to be who he is. He never apologizes for being gay and I love that. It shouldn’t be a big deal, just like he said he didn’t want it to be. His family is so supportive and the scene where his parents come into his room and his dad tells him that he’s so proud of him… I was so happy for him! Even though he wasn’t worried, his parents were so supportive. I strive to be like his parents when I have kids. 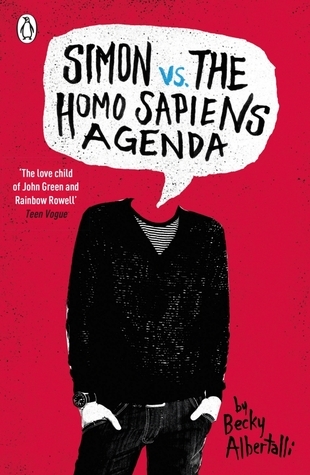 I LOVED that this book was about the love story and life of Simon, not the fact that he was gay. There isn’t enough of that portrayed in literature. Sexual preference and identity should have no impact on finding someone to love, and the story of that. This was cute and beautiful and perfect. I loved it. The writing style reminded me of John Green and Jenny Han. Very easy to read and fast enough to read it in two days *raises hand. * Also, the acknowledgments section of the book is so cute and is such a bonus part of books for me now. There are so many hints and clues put in there and awwww. I love when authors mention their other author friends because it makes you feel like part of it because you’ve read books by all of them. So cute. If you’ve been putting off this book, read it. If you’ve never heard of this book, 1. where have you been? 2. read it because it’s a perfect story. I’ve read three other reviews of this book today… I guess everyone is excited about the movie…. It’s such a beautiful book, I can’t wait to watch it on screen….